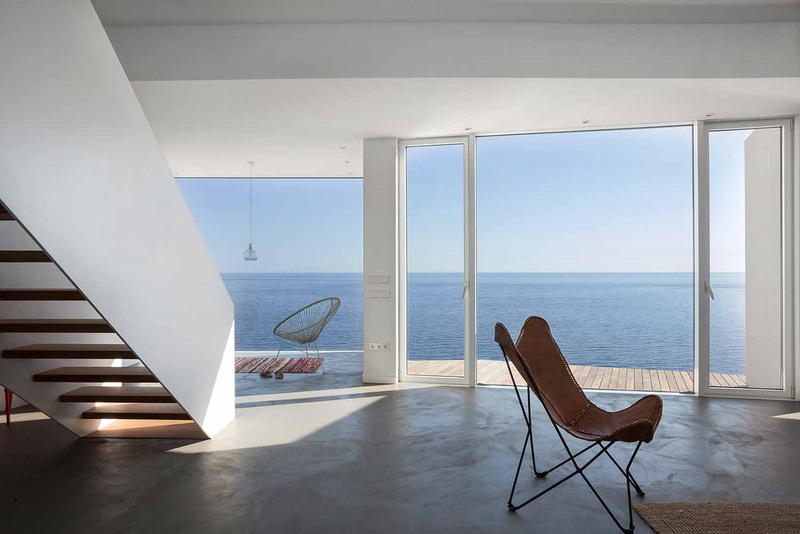 Perched on the cliffside above the Mediterranean Sea in Cap de Creus, a rocky peninsula off Spain’s Costa Brava a few kilometres south of the French border, Sunflower House is both blessed with breathtaking views and saddled with a sun-deprived orientation that also leaves it completely exposed to the region’s punishing north winds that can reach up to 180 kilometres by hour. 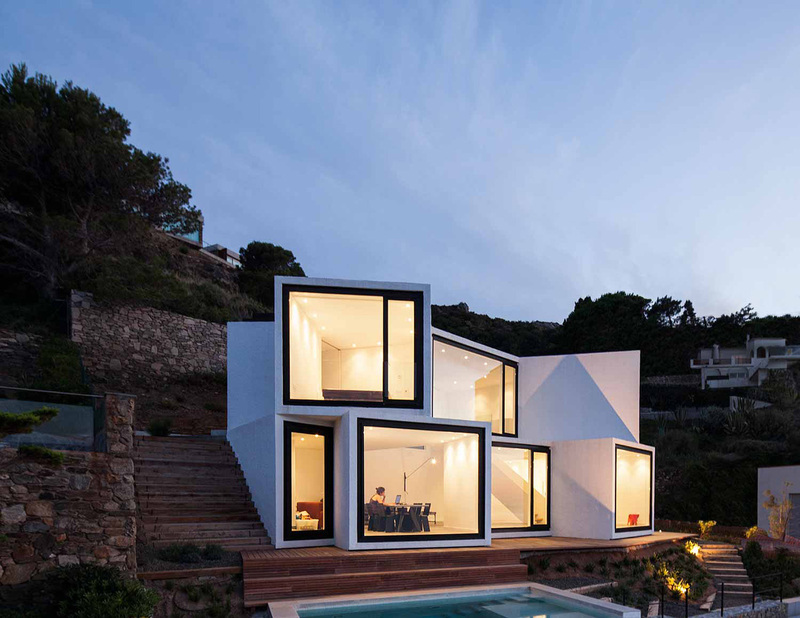 Barcelona and Mexico-based award-winning architecture studio Cadaval & Solà-Morales faced these challenges with gusto and ingenuity, taking advantage of the local topography and climate to design a modern residence that takes in its surroundings in sips rather than gulps. 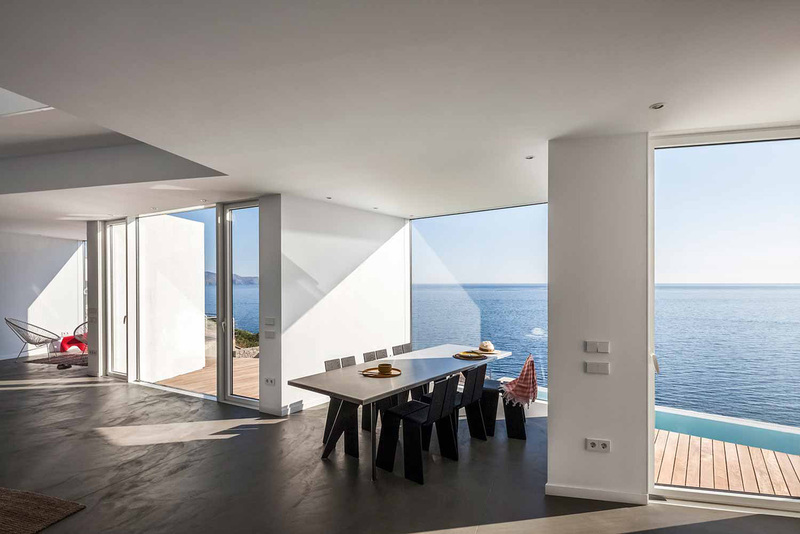 Diving precipitously into the sea, the dry, tree-less foothills of the Pyrenees create a wild landscape of ever shifting views that lend Cap de Creus a dramatic sensibility. 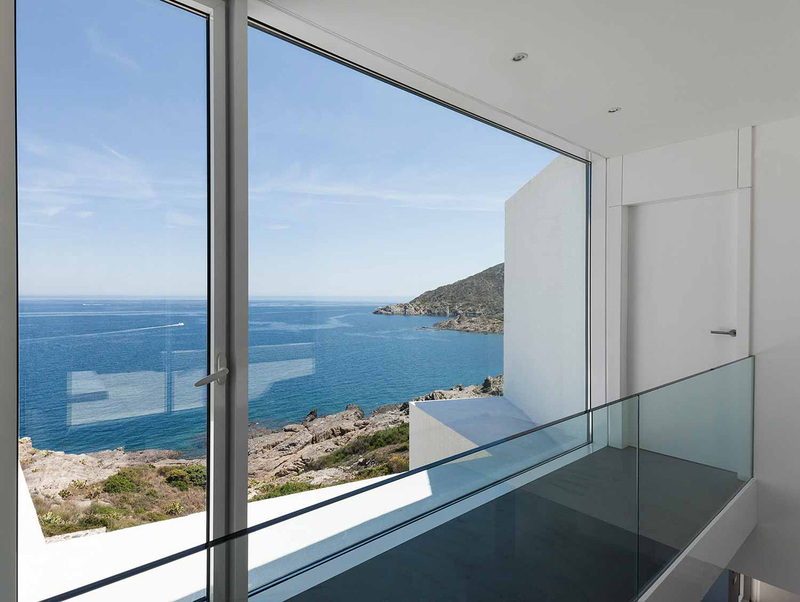 It was this scenic quality with its promise of great views along with the Mediterranean sun that attracted Mel and Geoff, the house’s owners, to this plot of land. 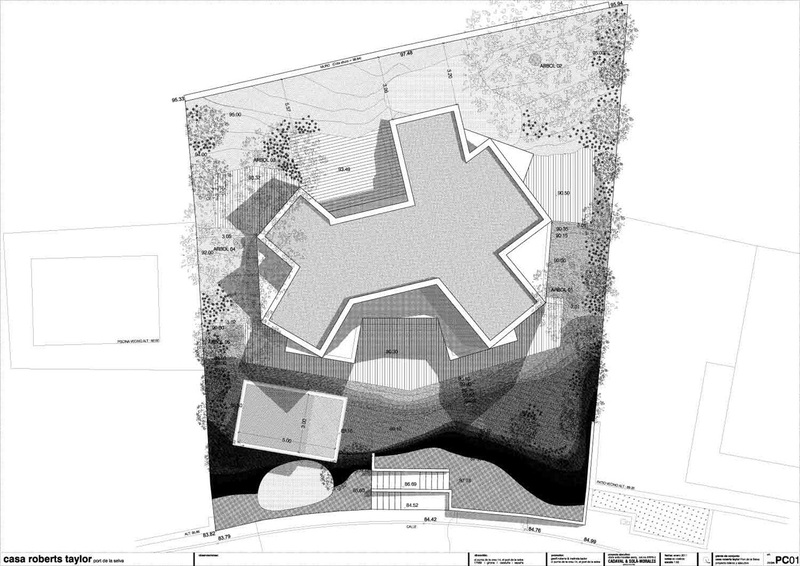 Its north-facing orientation however meant that despite the panoramic vistas sun exposure was minimal. 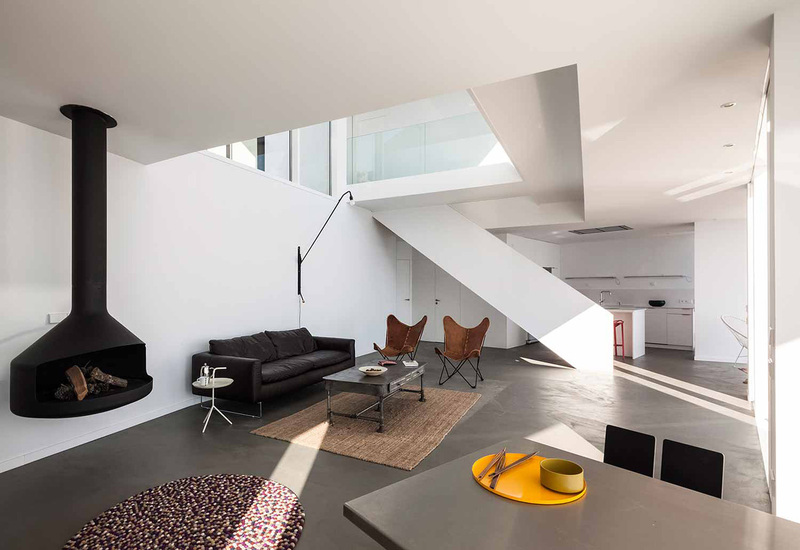 The design of the two-storey house therefore evolved from the twin quest for views and sunlight. 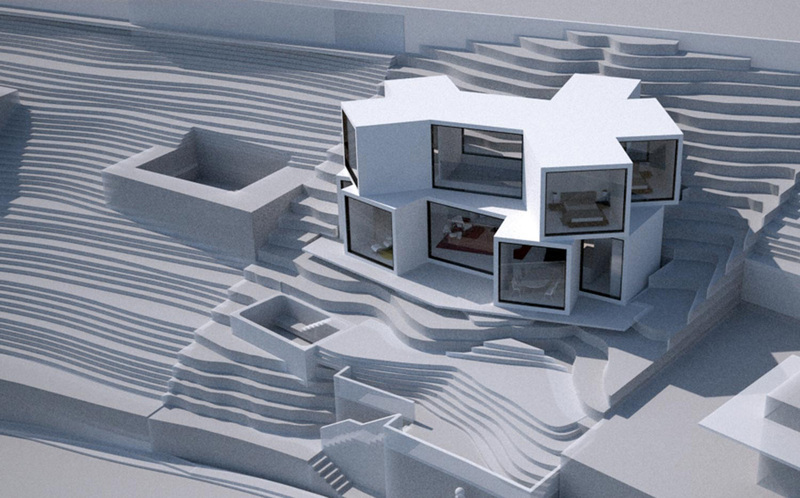 Similarly to a sunflower that turns its head to track the sun, each room juts out in a different direction to optimize its sun exposure as well as break down the sweeping seascape panorama into intimate views. 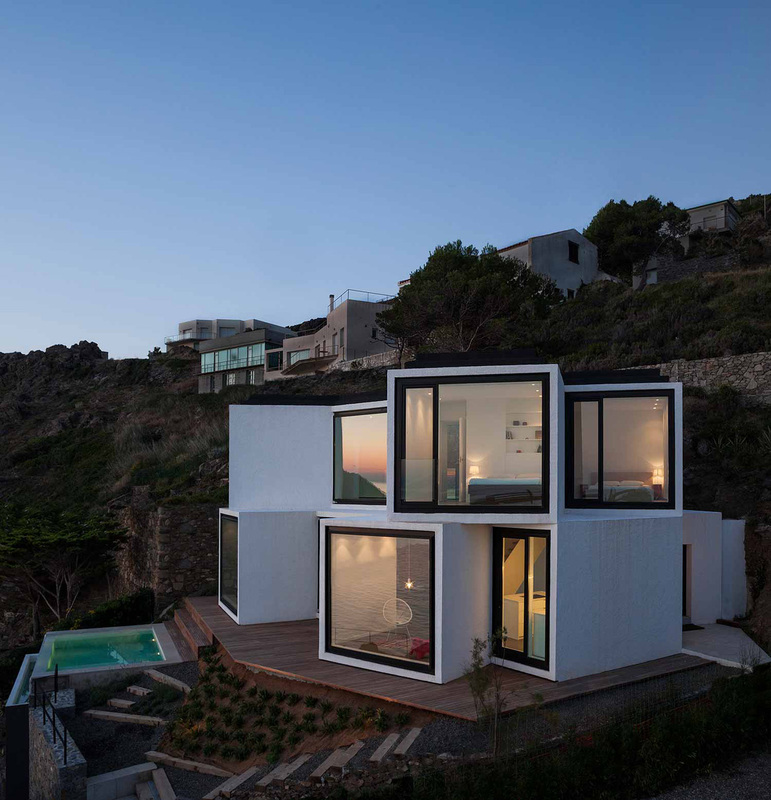 On the upper floor, the three bedrooms fan out to enjoy private views of the open sea while a seating room on the back opens up to a patio bound by the building and rock and thus protected from the strong local winds. On less windy days, the occupants can enjoy the decked terrace on the front and the infinity pool lower down the landscaped slope. 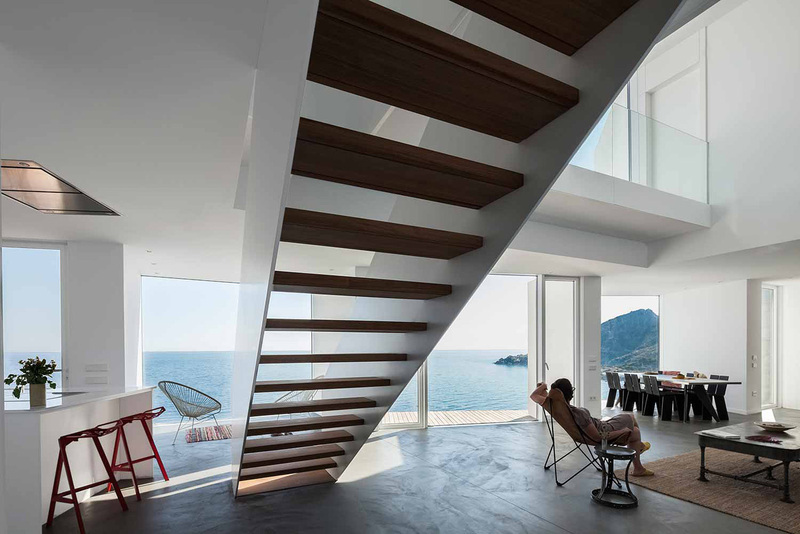 The house is built exclusively out of local materials with the only exception being the high-tech glazing usually found in skyscrapers, which had to withstand not only the gusty winds and the solar heat but also the extreme humidity of the coastal location. 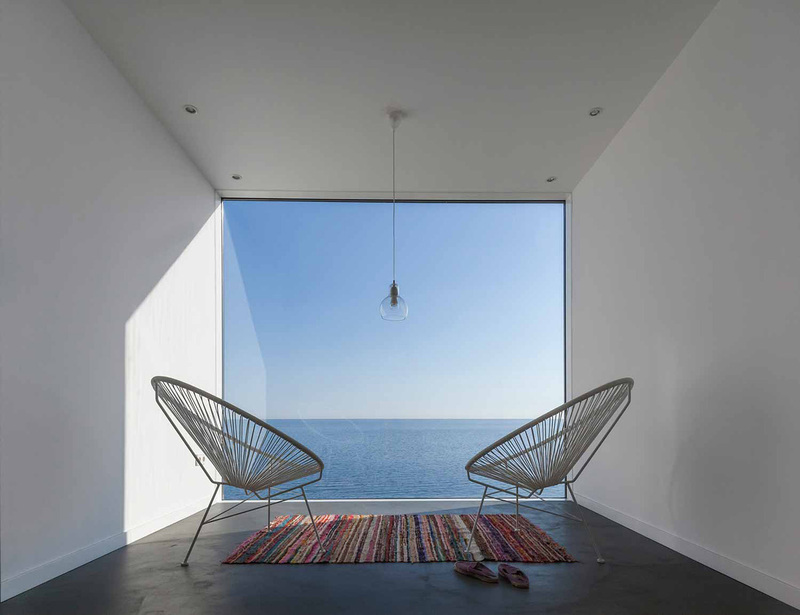 Inside, a minimalist aesthetic of white walls and ceilings and dark grey screed flooring, gives the interiors a neutral aura against which the deep blues of the sea and the shifting hues of the sky stand out in all their glory. 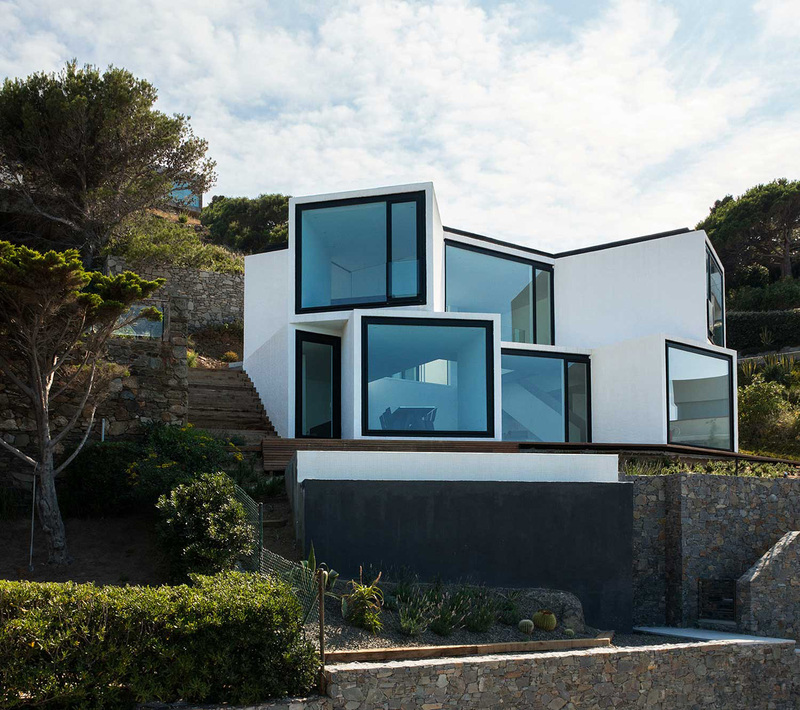 From afar, the protruding cubic blocks appear as a modernist sculpture of geometric abstraction, enhanced by its brilliant whiteness set against the brooding rocks and shrubs of the cliffside, a fitting description for a house that contains such kaleidoscopic views of the open sea. 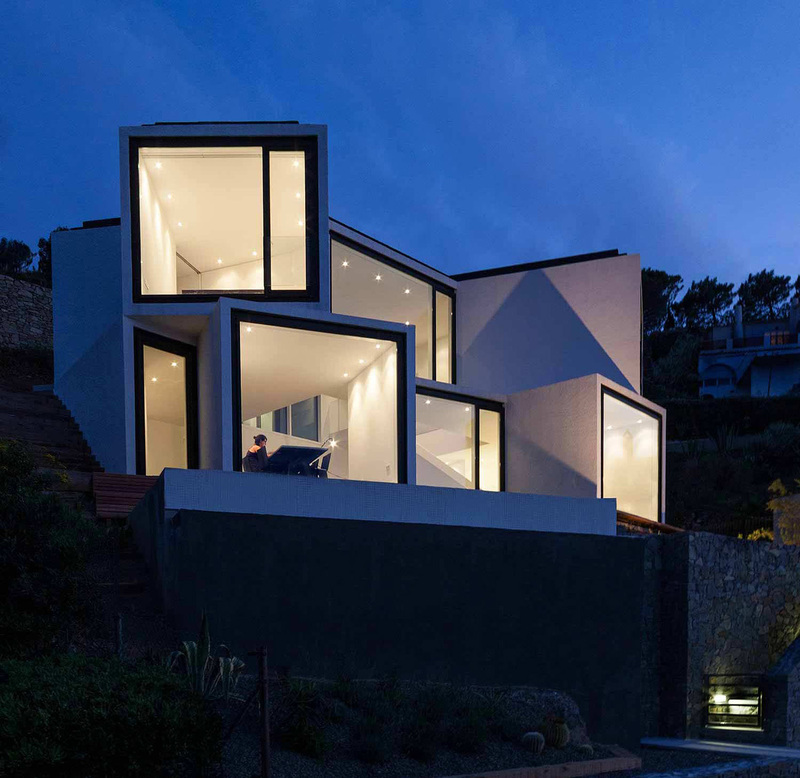 Also we recommend you to check other creative houses on our site.